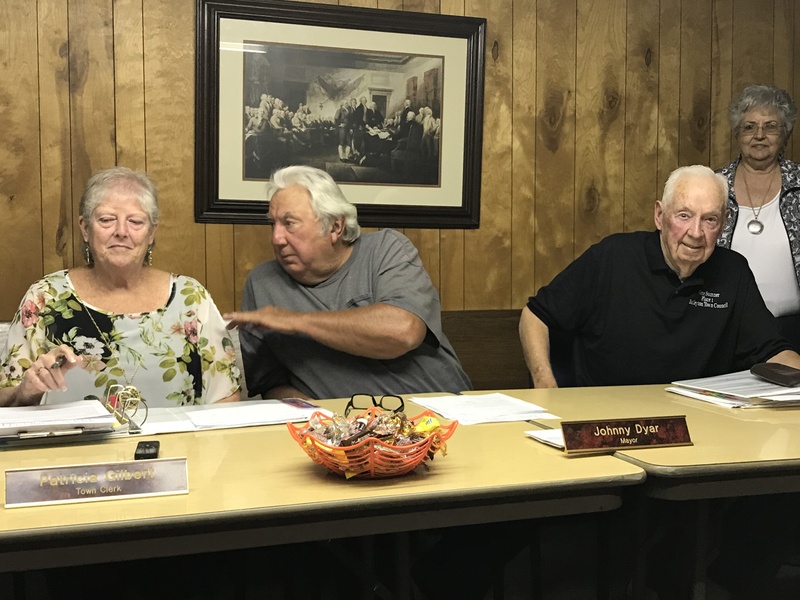 BAILEYTON – The Baileyton Town Council this week voted to install rumble strips on Schoolhouse Road, citing speeding and safety concerns. The council discussed the request for the strips on Schoolhouse Road, near Walker Brothers Lumber, particularly safety concerns about where trucks are entering and exiting the location. Because Walker Brothers is close to the road, extended cab or longer trucks or trucks with equipment, such as ladders, can extend out into the road. The council voted unanimously to approve Walker Brothers’ request for the speed/rumble strips. The council had a lengthy discussion regarding needed maintenance at the town’s ball fields. At its previous meeting, the council discussed a bid of $20,000 for field improvements. It was determined at the August meeting that a second bid should be sought. Pro Rain Irrigation, a company specializing in golf courses and athletic fields, submitted a bid for $17,068.85. The council discussed the benefits of having the work done under a signed contract, ensuring that if problems come up, the hired contractor would be obligated to remedy them. The bid by the contractor includes repairs and corrections to the current drainage system and improvements to the infields and extending base paths. The council moved to accept the bid, pending a written contract from Pro Rain Irrigation. Complaints and concerns regarding the outfields were also discussed. It was decided that those issues could be addressed by the Town over-seeding, fertilizing and using an aerator on the fields to help thicken the grass and using sand to fill in holes. A 10-acre plot of land adjacent to Baileyton Town Hall was offered to the Town for $10,000 an acre, the seller saying the land could be paid for over 10 years with no interest to the Town. The purchase was approved unanimously. Rhonda Van Zandt addressed the council regarding the Knapsacks for Kids program implemented several years ago. For next year’s budget, Van Zandt requested $500 for the continuation of the program. The backpack program is a community-sponsored program with many local churches and businesses donating money or items for backpacks full of food items which are sent home on the weekends with students of families facing food insecurity. Representatives from the Baileyton Volunteer Fire Department presented their budget request to the council. There were no changes from the previous year’s budget request. Concerns over the condition of the town’s flags were brought to the council’s attention. Dyar has requested a flag from Montgomery. Flags at the Alabama Capitol building are flown a short time before being gifted to towns throughout Alabama. Baileyton has requested one of the flags. Installation of Baileyton’s two additional storm shelters has begun, with one being installed at the park and the second behind the old school. To cut costs, the Town is utilizing county trustees to help with the installation. Certified electricians and plumbers will be used to complete the projects. The bid for the shelters was awarded to Survive-A-Storm Shelters of Thomasville, Georgia in June in the amount of $179,990, with the Federal Emergency Management Agency (FEMA) covering 80 percent of the expenses. Baileyton’s 20 percent contribution does not have to be fully made in taxpayer money. Land owned by the Town, as well as work by Town employees and Town equipment, is evaluated and assessed as part of its contribution. With no one available to oversee the storm shelter project, Dyar was given permission by the council to purchase items as needed during the installation. The council approved the purchase of a new dehumidifier for the existing storm shelter. It also approved the purchase of a steel pole saw to help safely cut back trees obstructing the new shelters. The Town was recently awarded a $3,000 grant to begin the installation of lights on the walking trail. Additional grants have been requested that will be needed to complete the lighting of the trail. The current grant will cover the cost for solar lights on approximately one-third of the trail. Town Clerk Patricia Gilbert was given permission by the council to research banks and credit unions regarding certificates of deposit. A motion to pay all unpaid bills was approved, ending the discussion of planned items. Councilman Greg Griffin asked to address the council. He brought up concerns he received from members of the community about the previously approved plans for a new town hall. Others acknowledged the concerns and the council said the issue will be explored further at its October meeting.